This Mental Health Awareness Week, we're shining the spotlight on those encouraging us to talk about our mental health as we all know that a problem shared is a problem halved. Leading the way is Katelyn Marie Todd whose honest Facebook post illustrates the grim reality and everyday struggle of what it's really like to live with depression. Has depression ever had an impact on your life in any shape or form? Whether you've seen a friend or family member going through it or perhaps even suffered yourself, you'll know it's a daily struggle to live with. You might even be aware of how difficult sufferers find performing even the most basic of everyday tasks. Things that are integral steps in our daily routines that don't take much consideration at all for non-sufferers like showering and washing our hair, for example. But most of the time, the images representing depression on social media don't actually reflect this accurately at all. You know the ones I'm talking about - those black and white stocks of a girl crying or a man looking off into the distance. Now, brave Facebook user Katelyn Marie Todd, a sufferer of depression herself, has spoken out to try and put a stop to this, showing us what living with depression is really like, from the point of view of someone who's in that very real situation right now. 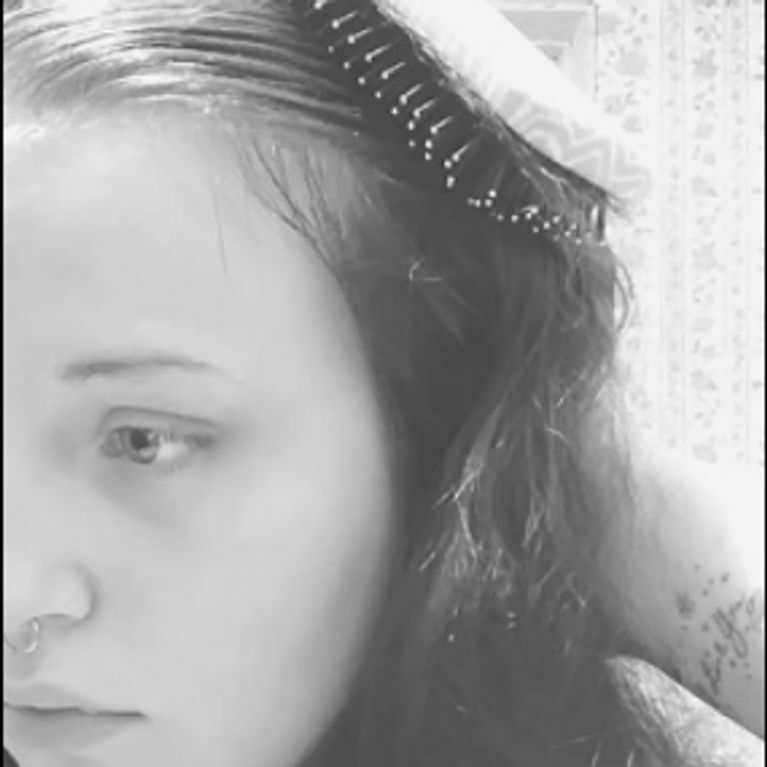 The powerful post, which now has more than 220,000 shares, shows Katelyn brushing her hair, which, at first glance, doesn't look out of the ordinary until you read her upsetting message which ultimately tells users that ‘depression isn’t beautiful'. Captioning the image, she explained: "I brushed my hair today. For the first time in 4 weeks. It was matted and twisted together. It snapped and tore with every stroke. I cried while I washed and conditioned it because I forgot how it felt to run my fingers through it. I brushed my teeth, too, for the first time in a week. My gums bled. My water ran red. I cried over that, as well. "​When I got out of the shower, I couldn't stop sniffing my hair and arms. I've avoided hugging people for a while because I never smell good. I always smell like I've been on bedrest for a week. I have no clean clothes because I'm too tired and sad to wash them. "Depression isn't beautiful. Depression is bad hygiene, dirty dishes and a sore body from sleeping too much. Depression is having 3 friends that are only still around because they have the patience and love of a saint. "Depression is crying until there's no more tears, just dry heaving and sobbing until you're gasping for your next breath. Depression is staring at the ceiling until your eyes burn because you forget to blink. "Depression is making your family cry because they think you don't love them anymore when you're distant and distracted. Depression is somatic as well as emotional, an emptiness you can physically feel. "Please be easy on your friends and family that have trouble getting up the energy to clean, hang out, or take care of themselves. And please, please take them seriously if they talk to you about it. We're trying. I swear we're trying. See? I brushed my hair today." We at SoFeminine applaud Katelyn for speaking out so candidly about the daily struggle people with depression go through. It's SO important for outsiders to try and understand how it really feels for the sufferer and this account is spot on. This frank way of discussing the whole realness of depression - ugly bits and all - is what we so greatly need in order to break the stigma surrounding it. And the more we do to break this stigma the better. Why Is Office Bullying Getting Worse And How Can We Stop It?